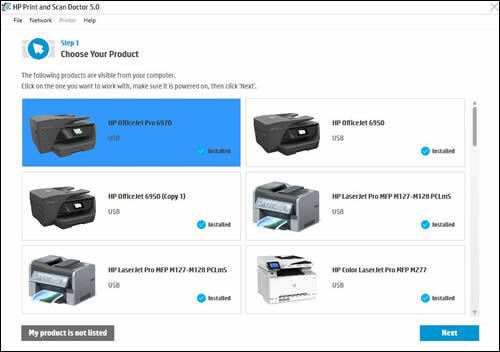 You can use HP Print and Scan Doctor to print a print quality diagnostics page, clean or align the printhead, and print a printer diagnostic page. In the HP Print and Scan Doctor window, click Printer. In the drop-down menu, select Printer Services. 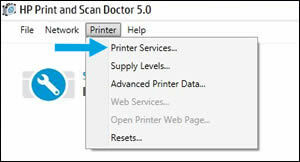 Click an icon to select the task you want HP Print and Scan Doctor to complete. 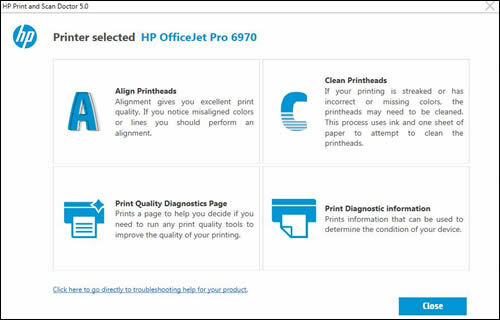 Print a Print Quality Diagnostics Page to evaluate the print quality. You can use this information to help to troubleshoot print quality issues such as broken lines, faded or missing colors, and streaks. If the alignment box and lines from a Print Quality Diagnostics Page are not straight and connected, align the printhead to resolve the issue. If the color blocks from a Print Quality Diagnostics Page display white lines or colors are faded or missing completely, clean the printhead. If the printhead is badly clogged, you might need to clean the printhead several times to restore normal print quality. When you need to turn off the printer, always turn the printer off with the Power button located on the printer to avoid issues that require cleaning the printhead. Print a diagnostic report to view the condition of your printer.